Yesterday’s Jesus and Mo arrived late because the author had email problems. And the strip, called “after2”, is ten years old. Still, it instantiates the true meaning of the phrase “begging the question”: assuming what you’re trying to prove. This entry was written by whyevolutionistrue and posted on January 31, 2019 at 8:30 am and filed under Jesus and Mo. Bookmark the permalink. Follow any comments here with the RSS feed for this post. Both comments and trackbacks are currently closed. The prophecies in Daniel, like the Messianic prophecies in the Book of Isaiah, are all retcon. I think you might be talking about two different phenomena. The Messianic prophecies in Isaiah are retconned in the sense that Christians took Isaiah and either picked out bits of the text that they wanted to be prophecy and wrote Jesus’ life around them, or cherry picked bits of text that seemed to mirror what they knew of Jesus life and then said “hey that’s a prophecy”. On the other hand, the prophecies of Daniel do describe real events that actually happened. This is because they were written after the events. In fact, the composition of Daniel can be dated quite accurately by looking at when his prophecies started to go wrong, which was in around (IIRC) 164 BCE. 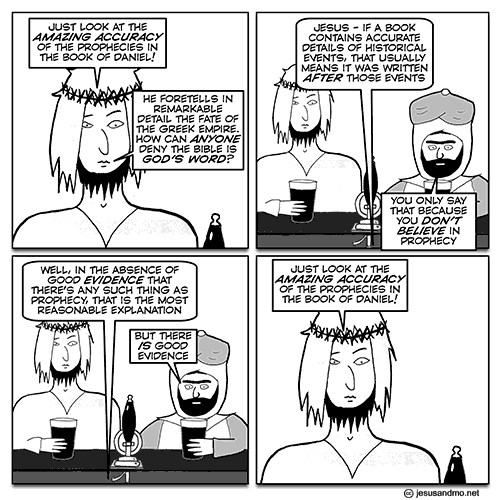 Yes, Danial was retconned to make it look like a prophecy; the life of Jesus was retconned in the New Testament to make it look like it fit the prophecies of Isaiah. 1.) It must be written before the fact, not after it. 2.) It cannot be something that is likely to happen anyway. 3.) It cannot be phrased in such a vague way that it can be applied to a large range of possible outcomes. 4.) It doesn’t count if someone who knows about the prophesy fulfills it on purpose. Great basics, Sastra, yet so many do not appear to heed that advice. I think Matthew (the Gospel) is particularly guilty of No 4. He always makes up stories in order to fulfill any odd prophecy. Hence: ‘false prophecies’ and ‘false prophets’ can confidently be used in a textbook to show what a pleonasm is. All prophecies are false, but not all falsehoods are prophecies. 5) It must specify a finite time scale for the events to happen in. Good addition— though that might fall under the 2nd one, if the prophesy is unbound to time. Consider I prophesy that Prince Charles will succeed Queen Elizabeth II in the next twenty years. That satisfies number 5 but not number 2. No, that’s ‘bound to time’ (i e has a deadline.) A prophesy with no finite scale might be something like “A despised son named Charles will nevertheless succeed to the British monarchy.” Without a reasonable time period, assuming the British monarchy continues for a longtime ( probably for the sake of the tabloids) now we’re looking at something likely to happen anyway. Yes, that’s why I said it satisfies rule 5, not it breaks rule 5. However, it breaks rule 2, because it is a fair bet that Prince Charles will succeed to the throne in the next 20 years, because the Queen is in her nineties. Sorry, I must have got the close bold tag wrong. Wait. Aren’t you being a bit strict? What about religious/poetic license and the need to fulfill Grandma’s wish to see Grandpa again? With the direction things are going on line and with social media finding truth is getting more difficult all the time. With millions of people believing in scripture or what they see on Face book they are ripe for fake everything. Trouble is, “begs the question” now actually does mean “prompts the question.” The original, “correct” usage is simply too obscure for most people to understand, much less to use in the proper context (to mean “assumes the conclusion”). “cultivate an attitude of serene detachment” — Sounds like advice that could cover a lotta ground. I still like -no, I’m pedantically keen- to use ‘begs the question’ as ‘assumes the conclusion’, it sounds so much better than ‘circular reasoning’ or indeed ‘assuming the conclusion’. I know it is a losing battle, but at least a worthy one. Oh, I think ‘circular reasoning’ is an excellent phrase. It illustrates the phenomenon perfectly. God is omnipotent and infallible. Because it says so in the Bible. Which was written by God, because it also says that in the Bible. Which is therefore infallible, so when it says God is infallible, that is infallibly true. Perfect circular argument, without a loose end anywhere. I dislike it because somebody who has never seen the phrase before would assume the normal modern English meanings of all the words involved and infer it means “raises another question”, which is why the alleged incorrect meaning took hold so easily. “assumes the conclusion” or “is circular reasoning” is much clearer to the modern English speaker, so unless you are going for poetry over clarity, they should be used in preference IMO. Ha ha ha…very good. Bunch of backward nutcases. That’s the trouble with drinking what looks like Guinness, no matter how divine you think you are, it reduces you to the lowest common denominator, in this case, pissed.